Find hotel near Gravina Museum Of Fine Ar .. 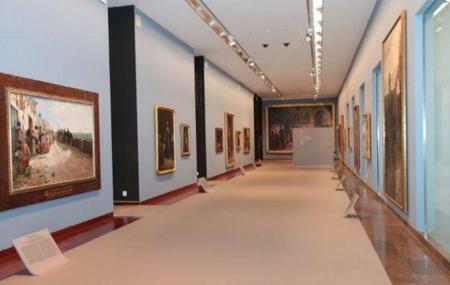 The Gravina Museum of Fine Arts is housed in the Provincial Palace of Alicante. Also called El Palacio Gravina, the museum was established with the purpose showcasing some of the best artistic talent from the region of Alicante. Hence, on display at the museum are art works by local artists. In total, there are around five hundred pieces of artwork in the museum’s collection. While there, do check out the remarkable portrait of Fernando VII by Vincente Lopez. A coffee shop in the premises. How popular is Gravina Museum Of Fine Arts? People normally club together Alicante Museum Of Contemporary Art and Explanada De Espana while planning their visit to Gravina Museum Of Fine Arts. Really nice collection, but some of the rooms were closed and we can only see what is inside through the window. Small. Intimate. Worth a visit. One hour plus would suffice. Some paintings with English translation - Picasso’s teacher being one of them. Enjoyed a free musical evening - piano & student classical singers 17th April @ 6.00 p.m. Many interesting exhibitions and paintings in there. Definitely worth visiting when in Alicante.